If you are reluctant to dive headfirst into a new culture, you might be more at ease visiting Latin Soul for your first sample of the Salsa scene on Okinawa. Located less than a kilometer away from Futenma, Latin Soul is located just across the street from Oyama Elementary School, a little ways past the Futenma turn if you are driving south on route 58. This cafe's menu is in English and Japanese, and the meals all have names that are a little easier to understand and more westernized than many of the other Latin cafes on island. Many of the other establishments on island keep the meal's native name on the menu, thus making it a little more difficult for those unfamiliar with the meals to understand what they are. The meals are also very affordable, ranging in prices from between ¥450 to ¥800 per plate. Drinks are also affordable, with beer and mixed drinks priced between ¥500 and ¥600, and you can even purchase a bottle of awamori, wine, or champagne for between ¥2,000 and ¥9,000 depending on your preference. Latin Soul is an excellent spot to become acquainted with the sights and sounds of Salsa while enjoying a less-unusual meal. If you are interested in learning to dance to Salsa music, Latin Soul hosts dance lessons on Sundays from 6 - 8 p.m., and Erik, the instructor, is arguably the best Salsa Dancer on island. He recently won first place in an on-base contest, and he also teaches on base. According to student Rio Goto, "Hiro is the best on Okinawa. He has a sophisticated style." If you want to learn from the best, you will do so here. Also, the dance floor is made of wood, so it is very suitable for dancing. 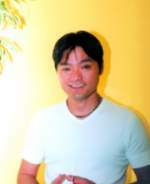 Owner Hiroaki "Hiro" Kamiya opened Latin Soul on May 21, 2001. He says he started to get into the Salsa scene in 1999 when he saw the Diamantes and Kachimba 1551, and he made plans to open his own business while he was working in various Latin bars in Naha. Though the cafe/club receives many visitors, Hiro says that 80% of his customers are female. You might especially want to visit Latin Soul on Wednesdays, Fridays, Saturdays, and Sundays. Wednesdays are Ladies’ Day, with 50% off all drinks for all women, Fridays and Saturdays are Salsa Nights with a live DJ. The admission is ¥1,000 and includes one drink. Sundays are your chance to learn to Salsa dance with lessons taught by instructor Erik Rodriguez from 6 to 9 p.m. The admission is ¥1,000 and includes one drink. When we came to Latin Soul, Rio Goto had just recently been hired by Latin Soul as a bartender and was working his first day at the venue. In 1999, Rio bought an airplane ticket for $3,000 that enabled him to travel around the world to fifteen selected cities during the timeframe of one year. During this trip, he stayed in many South AmErikan countries including Spain, Argentina, Cuba, and Brazil and was drawn to the music. Originally from Mito City, about 100 km from Tokyo, Rio wanted to live on a tropical island so he packed up and moved to Okinawa. He claims that Okinawa has the same look as many other places in Japan but it has more of a tropical culture with open, friendly, peaceful people. He says he likes Okinawa and wants to stay forever. Recently hired at Latin Soul, he believes he will love his new job because he can work and dance at the same time. Rio began learning to dance Salsa from instructor Erik about five months ago and has done well. "I listened to Salsa music on my trip, but I couldn't dance until I started learning in Okinawa," he says. 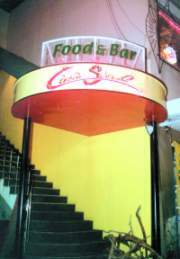 Latin Soul is a classy cafe/club with a casual comfortable feel and a warm atmosphere. If you're interested in learning more about the Salsa scene while staying in your comfort zone, be sure to check this place out! Sun. ~ Thu 7 p.m. - 3 a.m.
Fri. & Sat. 7 p.m. - 5 a.m.